Practically all karateka include kata practice as part of their training. The question asked by the vast majority is, "Why?" Certainly many karate practitioners slight the practice as they feel it is a pointless exercise that does nothing to increase fighting skill; "I hate kata. I'd rather spar!" is the 'macho' boast made by many a misguided junior grade (and sadly a few senior ones). Without an understanding of the information and techniques included within kata, karate is a very limited art. How many karate clubs include close range striking, grappling, throwing, joint locks, chokes & strangles and ground fighting in their practice? The answer is all of them! But very few realise it as they leave such methods hidden away within the katas. Karate was developed to be complete and effective method of civilian self-defence. Karate, as it is practised by the majority of people, is at its best at middle to long range. However, most fights start close up and almost always include some form of grappling. Are we to assume that the past masters got it wrong? The founders of our art were able fighters who fully understood how real fights occurred. If you ignore the methods included within the katas then are only practicing a very small percentage of the karate syllabus. The majority of today's karate training revolves around techniques developed for use in the sporting environment. The original karate techniques, as recorded within the katas, are the ones for use in real situations against violent and untrained attackers. Katas were developed to ensure that the most effective methods of a particular individual or style were not lost. Contained within each and every kata is a complete system of fighting. In 1926 Choki Motobu (who was one of Okinawa's most feared fighters) wrote, 'The Naihanchi, Passai, Chinto and Rohai styles are not left in China today and only remain in Okinawa as active martial arts' (Okinawan Kempo page 26). The key word in the preceding quote is 'styles.' This infers that Motobu believed all the katas listed to be systems in their own right. In the association to which I belong, we practice fifteen katas and hence fifteen separate styles of fighting (talk about cross training!). The katas were not intended to be used together - although there is no reason why they could not be - but were all intended to be used as a stand alone self-defence system. This is a very important, and often over-looked, fact. It is also important to understand that the techniques recorded within kata were designed for use in civilian self-defence. Kata applications were not intended to be used in a sporting context or on a battlefield against a trained warrior. 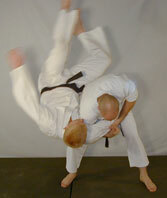 Kata deals with likely attacks from violent and untrained aggressors, not attacks from other martial artists. In a real situation we are highly unlikely attacked with complex manoeuvres or high kicks and hence it is very unlikely that a master would have spent much time developing methods for dealing with such attacks. We have a far greater need for defences against wild swings, head butts, tackles etc. The vast majority of real fights also take place at close range and hence the vast majority of kata applications are also for use at that distance. Techniques such as close range strikes, throws, takedowns, chokes, strangles, arm bars, leg locks, finger locks, wrist locks, neck cranks, ground fighting etc. are common place within the katas. These methods are rarely removed from the kata and practised in the majority of modern dojos. If we wish to practice karate as the complete art that its founders intended it to be, then we must study our katas in sufficient depth and include all aspects of the art in our regular training. So why did these methods fall from grace in the first place? The first thing to bear in mind is that the kata were closely guarded secrets. In his book 'Karate-do Nyumon' Gichin Funakoshi states that an elderly Okinawan karateka once contacted him as he wished to pass on a kata before he died. Funakoshi was unable to go and asked that the kata be taught to Gigo (Funakoshi's son). Gigo was taught the kata in a locked room with shuttered windows. The old man told Gigo that in his lifetime he had only shown the kata to one other person, and when he did he had crucially altered it. This tale helps to illustrate the level of secrecy that originally surrounded kata and its instruction. A kata would only be taught to students who had proved themselves worthy, and only after it had been practised for a sufficient time would the master then reveal the hidden techniques that the kata contained. The katas were put together in a way that was deliberately meant to conceal the techniques within them (the very fact that the opponent is not present is often enough to hide a movement's meaning). This was to prevent the casual observer from learning the methods of a particular master or school and then devising counters or using the skills in a dishonourable fashion. In addition to the fact that the katas were closely guarded secrets, it is also important to take into account the changes in approach that karate instruction underwent in the early part of the last century. In 1901 the great Karate Master Yasutsune Itsou placed Karate onto the physical education program of the Shuri Jinjo elementary school. As it stood Itsou believed Karate to be too dangerous to be taught to children and set about disguising the more dangerous techniques. As a result of this disguising of techniques, the children were taught the katas as mostly blocking & punching. This enabled the children to gain such benefits as improved health and discipline from their karate practice without giving them knowledge of the highly effective & dangerous fighting techniques that the katas contain. This is significant as the majority of modern Karate uses Itsou's terminology and hence the labels attached to various techniques may well have no relation to their intended use. When teaching the katas to his adult student's, Itsou would give full instruction in all the highly potent techniques that the katas contained (when the student was trusted and ready). The main difference between the adults and children's training would simply be a matter of approach as opposed to any change in subject matter. Katas can be practised for health or for fighting skills - the katas are the same but the approach is different. In his writing, Itsou reminds us to be clear as to our intentions. In 1908 he wrote, "Karate katas should be practised with the idea of whether it is for physical training or for its practical use." This new labelling of techniques undoubtedly mislead many as to the true applications of many kata movements. A third reason as to why the applications of the forms are not widely practised today is the shift in emphasis that Karate underwent when it was introduced to Japan. The Japanese required a number of refinements if Karate was to be widely accepted by them. There had to be a standard training uniform (a lightweight Judo gi was adopted). A method of competition had to be devised. There had to be a grading system (again the kyu /dan grade system was plagiarised from Judo). The art had to be distanced from its Chinese origins (hence the name change from "Chinese-hand" to "empty-hand" - Both being pronounced "Karate"). And, most significantly of all, it was requested that the more unpleasant aspects were omitted as the Japanese felt much of Karate was excessively violent. The eye gouging, throat crushing, testicle seizing and other such unpleasant (but highly effective) methods were further hidden away within the katas and no longer taught openly. This led the great Choki Motobu to proclaim that the karate of Japan was "imitation Karate, not much more than a dance." All the changes that the katas have underwent has in no way diminished the effectiveness of their content. It is simply the way in which the katas are approached and the misunderstandings that surround them that are of concern. Today many Karateka simply practice their katas to pass gradings or win trophies, and hence are only concerned with the kata's appearance. The primary purpose of kata is to enable us to inflict pain upon our aggressors in response to unprovoked acts of violence. Some people do not care for this view and talk of how the performance of a perfect kata can be an end in itself. A Rolls Royce that does not start up may look beautiful but it could not be described as perfect because it cannot perform the task it was designed to. Likewise, the Katas were designed for use in combat and hence I fail to see how a kata that cannot be used in combat can ever be described as 'perfect' regardless of how visually pleasing it may be. Gichin Funakoshi in his book 'Karate-Do Kyohan' states, "Once a form has been learned, it must be practised repeatedly until it can be applied in an emergency, for knowledge of just the sequence of a form in karate is useless." We should remember that the katas are a means to an end, and not an end in themselves. Hironori Otsuka (founder of Wado-Ryu) wrote in his book, 'Wado-Ryu Karate', "Martial arts progress from kata to kumite, kumite to combat and so on. Kata is a fundamental aspect of martial arts and hence is unyieldingly important." Here we are told that Kata should progress to kumite and then to combat. I feel that this is crucially important, as many karateka do not permit the use of kata techniques during sparring. Obviously the neck breaks, eye gouges, seizing of the testicles should be omitted, but what about the throws, chokes, strangles or locks? By omitting these techniques from live practice we do not get the opportunity to develop the skills and attitudes needed to execute the techniques in a live situation. Also, if we do not test our understanding of the kata's applications in a live environment how are we to be sure that they will work? The application of the katas has become more popular of late (but still not anywhere near as popular as it should be) and hence many people are revisiting their katas with renewed enthusiasm. This has lead to a flood of 'applications' for various katas being proposed. Often these 'applications' are far too complicated to be of any use in a live fight. On a compliant opponent everything works! Learning the martial arts is a slow and methodical process. It would be foolish to throw lower grades into 'all-in-sparring.' First they must learn the kata to a sufficient standard, then utilise the kata applications in prearranged sparring, before finally using the katas methods in live sparring. That which is quickly created is quickly destroyed - the whole process takes time if worthwhile skills are to be achieved. Certainly all instructors should utilise their kata applications in live sparing - how else can they have any confidence in them? The katas contain a vast amount of martial knowledge; Striking techniques, Attacking vital points, Grappling, joint-Locks, Strangles, Ground fighting techniques, Chokes, Throws, Takedowns etc. The amount of martial knowledge contained within the katas is staggering. Not only do the kata provide the techniques but, more importantly, they also include the principles upon which the techniques rest. The key thing is to understand "why" the techniques work. Try to get beyond the simple memorising of individual techniques and endeavour to fully understand the principles of combat upon which the katas are based. Principles are far more important than techniques. Principles can be applied in an infinite number of ways, but techniques are very specific and hence limited. You should aim to be an adaptable and versatile fighter. Endeavour to fully understand the principles and learn how to fight in accordance with them. Whilst initially this understanding will be on an intellectual level, you should aim to integrate these principles into your subconscious (this being the main purpose of kata practice). At this high level the body will instinctively act in accordance with these concepts and hence make the karateka extremely formidable. By concentrating on the principles, and the various ways in which they can be applied, a single kata becomes an inexhaustible supply of martial knowledge. Hironori Otsuka (founder of Wado-ryu) encourages us to adapt and experiment with the katas techniques (whist ensuring the principles remain constant) in his book 'Wado-Ryu Karate' (Pages 19 &20) Otsuka tells us, "It is obvious that these kata must be trained and practised sufficiently, but one must not be 'stuck' in them. One must withdraw from the kata to produce forms with no limits or else it becomes useless. It is important to alter the form of the trained kata without hesitation to produce countless other forms of training." If you only understand specific techniques you will be unable to apply them should anything alter. Grasp the principles and you will be able to adapt any technique - in line with the principles upon which it rests - to be of use in an infinite number of situations. The great Choki Motobu (who was one of Okinawa's most feared fighters) put it very eloquently when he said, "One must learn how to apply the principles of the kata and how to bend with the winds of adversity" (Tales of Okinawa's Great Masters by Shoshin Nagamine Page 96). Without a thorough understanding of the katas we are left with only a fraction of the karate syllabus. The commonly used techniques (kicks & punches) take up around 5% of the information available. If we wish to practice karate as its founders intended then we must study the katas in sufficient depth, utilise the kata's techniques in both pre-arranged & free sparring and endeavour to understand the principles upon which the katas rest. In this way karate becomes a complete and brutally efficient martial art. Within kata we have the chance to learn from the past masters and perhaps gain a little of their skills - It would be foolish in the extreme to ignore this marvellous opportunity.